"Pro Celebrity Golf by 2004 was spending half his time in London and the other half in NYC digging for wax to sell on Ebay. He'd been hittin up some NICE collections in the rotten apple, one belonging to Rawkus owner Jarret Meyer, one to D&D studios, but in the summer of 2009 he was introduced to Evil Dee and Mr Walt of Da Beatminerz through Bronx digger and MC/Producer Nobs. Golf cut a deal with Da Beatminerz on their record collection. "He was also introduced to Crazy Dj Bazarro, producer of little known Brooklyn Hip Hop crew Da Dysfunkshunal Familee. DDF had released two records in 1994 and one in 1997 and had guested on the Fondle'em Fossils album on Def Jux records. Apart from those releases and some elusive demo tapes from the late 80s there was little of their music commercially available. "Golf was given free reign to choose from both previously released material and unreleased cuts. He chose 3 tracks from the incredibly rare early EPs as well as 3 other unreleased tracks from the shelved 1994 Da Dysfunkshunal Familee LP. 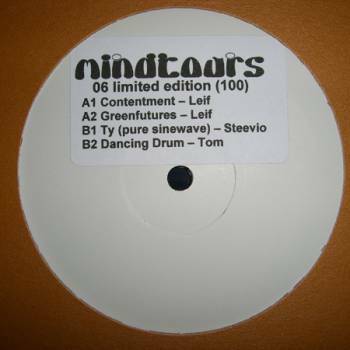 The limited vinyl release was sold through underground Hip Hop forums as a preorder-style release. Also check part 2 in the Bushwick series incoming, as Chopped Herring Records release another Da Dysfunkshunal EP of unreleased material from 1996 entitled 'Mixed Emotions '96 Demo EP'. "Da Dysfunkshunal Familee's significance in the New York scene should not be underestimated. They had been making Hip Hop since the late 80s and ran parallel (and often in competition) to Da Beatminerz' produced projects such as Black Moon and Smif n Wessun. While Black Moon were recording for Nervous Records, Da Dysfunkshunal Familee were dropping wax independently on Crazy Dj Bazarro's own label using their connections in the NYC music industry to get their voices heard. It is only now that they are getting props they were due 20 years ago. 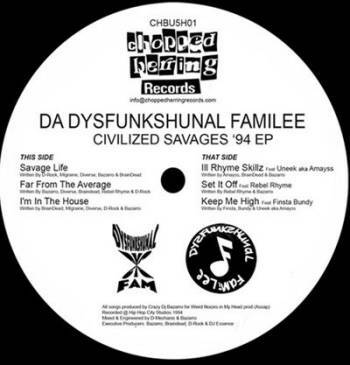 Read Crazy Dj Bazarro's own breakdown of the tracks released on the Civilized Savages '94 EP below for an insight into the workings of Hip Hop's lost heroes." “You guys have me being very grateful and excited that you love a sound I made up in a cold basement with no real equipment..It almost bringing tears to my eyes because of the memories I had recording these songs. You guys have kept the music alive and resurrected me as a producer to try to keep that same sound alive..90's style...I appreciate all the support and compliments...All I can say is Wow!!"